"Saving one animal will not change the world, but surely for that one animal, the world will change forever." 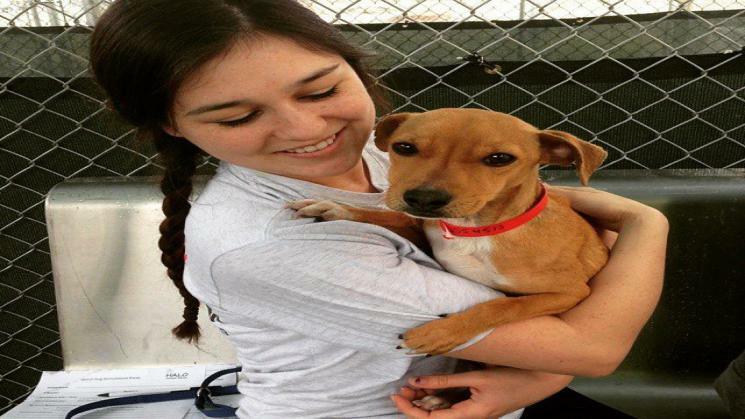 Ceph is a 1 year old Dachshund mix that currently lives in Phoenix, AZ at a rescue. I really want to bring him home. I am pressed for time though because I need the funds before I can go through with the adoption. I will be forever grateful for any help that I receive. I recently volunteered at HALO Animal Rescue in Phoenix, Arizona for the week of spring break from Colorado State University. That week was life-changing for me in a positive way and really opened my eyes to the problems that we have with over-breeding and homeless animals. There are hundreds of awesome dogs waiting to be adopted in small cement kennels but are usually getting passed up because of their age (too old) or because of people's unawareness of the issue at hand (still buying from inhumane breeders or pet shops at malls, etc.). I would equate the rescue to a prison but with "prisoners" that have done nothing wrong. Don't get me wrong, the rescue was immaculately clean and they have staff that genuinely care about the animals, but it is still no place for them to spend their lives. I would love to rescue them all, it really is heart breaking. However, I feel if I can provide a better life for even just one dog, while continuing to spread the word and educate others about this issue, then I will be making a difference. With paying for college, rent, food, and all the expenses that come with being a college student living on my own, I feel very heartbroken and frustrated not being able to provide for a dog like I want to right now. I understand everyone has financial hardships these days, but even if you can give $0.50, anything will help! I put the goal at $1000 for transportation costs (I will fly to Phoenix to get him, and fly him back with me in-cabin which is $125), my apartment requires a $400 pet deposit, and $25/month for pet rent. In addition, I don't have any dog supplies, so this money will cover a bed, toys, flea/heartworm medicine, grooming tools, and any leftover will go to food.